This is a complete and comprehensive CompTIA Security+ Certification (SY0-501) course. It is designed to prepare you to be able to take and pass the exam to become CompTIA Security+ Certified. Once you complete the course, you will have the knowledge and confidence to pass the CompTIA exam AND the skills to be a great IT security tech. This course is ideal as both a study tool and an on-the-job reference. Your new skills and the CompTIA Security+ Certification will help you land a great IT security tech job. Or, if you are already a security tech, get that raise or advancement you are after. There are no specific prerequisites, since the course covers all the topics in detail. It is a good idea to have an understanding of CompTIA A+ and Network+, or to be certified in these topics. You can learn more about these certifications from our Mike Meyers – Total Seminars CompTIA A+ and Network+ Certification courses on Udemy. Welcome to the CompTIA Security+ Certification; SY0-501. The Total Course from Mike Meyers and Total Seminars. This is the updated course that covers the objectives for the new Security+ 501 exam, launched in November 2017. The previous 401 exam will continue to be offered through July 31st, 2018. If you take this course, be sure to sign up for the corresponding 501 exam. 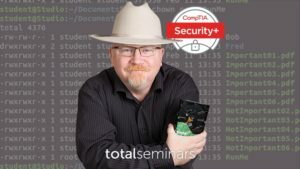 This course covers everything you need to know to pass your CompTIA Security+ Certification SY0-501 Exam. The first goal of the course is to make you a good IT security tech and, in the process, make sure you are ready to pass the CompTIA Security+ exam. This course is over 10 hours in length containing over 80 video lectures. This course is intended for anyone that is preparing for an IT Security position or looking to improve their security skills and become CompTIA Security+ Certified. However, it goes beyond that and will give you the skills you need to be a better security tech on the job. I don’t have good internet speed. Torrentz is not working. So, please can you give these files via something else like google drive, I’ll be so thankful.